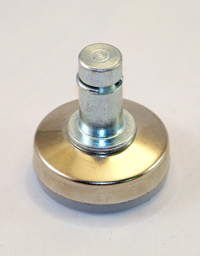 IEC’s bell glide/caster replacements are made to replace caster wheels on rolling chairs, tables, displays, etc. The steel stem has a grip ring, an the bell glides have a black nylon base. The IL9-CAST (shown here) has a white nylon base with a nickel plated shell.